Myrtle Hardesty '54 left Butler University before graduating, but the two years she spent as a Bulldog always meant something to her and her family. So when she died in 2017, at age 95, she left the University a gift of $1.25 million to go toward scholarships in the College of Education. The Myrtle Browning and James E. Hardesty Endowed Scholarships will be awarded to undergraduate students who have financial need, are majors in the College of Education, and have a GPA of 3.0 or better. "She was one of those people who realized that she had been given a lot in life, and when you're given so much, you should turn around and give back," said Ena Shelley, Dean of the College of Education. "That was very much what she was about—giving back. We will make sure we do a good job with the gift she has given to us." Mrs. Hardesty told Dean Shelley she wanted the College of Education at Butler University to have the gift because her mother and father had been so proud of her for getting to Butler and for later becoming a teacher. Myrtle Browning spent two years at Butler. She married an engineer named James Hardesty—they were together more than 40 years—and moved to New Jersey. She earned her bachelor's and master's in teaching and counseling from Montclair State University, and spent her career as a guidance counselor at the Hubbard Middle School in Plainfield, New Jersey. In her retirement, she liked to spend time in the art studio in her home. In addition to her monetary gift, she also left one of her paintings to the College of Education. Dean Shelley visited Mrs. Hardesty at her home in New Jersey in early 2017 and described her as "absolutely darling. I'm so glad I got to meet her. She was such a sweet, sweet woman." The Dean said the Hardesty gift is going to make it possible for Butler to educate more teachers. "This is a great step forward in meeting the teacher shortage demands and for us to have some resources to offer students," she said. "This helps our ability to bring more students in to teacher education." This gift supports the Butler 2020 Strategic Plan which was approved by the Board of Trustees in the fall of 2013. Butler 2020 charts a bold course for Butler’s future through which it will preserve the University’s unique character, distinguish Butler as a school of choice for exceptional students, and increase its national prominence. In support of Butler 2020, the University has invested in new campus facilities, academic programs, and co-curricular offerings. In the past five years, Butler has built the Howard L. Schrott Center for the Arts and two undergraduate residential communities, Fairview House and Irvington House. In the fall of 2019, the Andre B. Lacy School of Business will open a new 110,000 square foot building. Additionally, Butler is actively fundraising to complete a $93 million Science Complex expansion and renovation. To learn more, visit butler.edu. The Myrtle Browning & James E. Hardesty Endowed Scholarships will be awarded to students with financial need. Return on investments in high-quality, early childhood education is significant and long lasting, PNC regional President says. The Butler Lab School has received a three-year, $150,000 grant from the PNC Foundation to support the school’s preschool program, improve the students’ emotional skills through the practice of yoga, and increase the quality of early childhood education in Indiana through multiple professional development opportunities for the community at large. with Lab School student Lucy Ansell. The grant will address the needs of underserved children in a school where 73 percent of students receive free or reduced lunch. The Lab School now has 22 half-day students and nine full-day students. Of those 31 students, 22 are on scholarship. 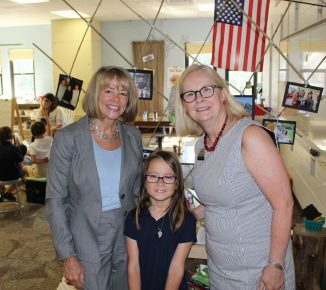 “Because of PNC’s financial involvement, these children’s educational dreams are being realized,” said Ena Shelley, Dean of Butler’s College of Education, which operates the school in partnership with the Indianapolis Public Schools. In addition, preschool students will be taught yoga, which has been shown to improve social-emotional skills. Yoga relieves stress, gives the students a chance to move purposefully, and teaches them how to calm down and focus. Shelley said Assistant Professor Lori Desautels, a nationally recognized expert in the area of applied educational neuroscience, is researching effective strategies to help children take control of their behaviors and potentially change the direction of their learning and emotional well-being. Applied educational neuroscience, coupled with focused attention practices as a part of a yoga program, would be implemented to train teachers. The third part of the grant will offer opportunities such as support for 20 educators to attend Indiana Partnership for Young Writers (IPYW) workshops, where topics such as Math, Reading, Writing, and Early Childhood will be addressed by the nation’s most respected education experts. During six lunar missions, American astronauts brought back a total of 382 kilograms (about 842 pounds) of rocks from the moon. On Tuesday, January 31, some of them were on display in College of Education Professor Catherine Pangan’s Science and Social Studies Methods class. The moon rock samples, with names like breccia, basalt, and anorthosite, came sealed in round, clear Plexiglas disks about six inches in diameter. 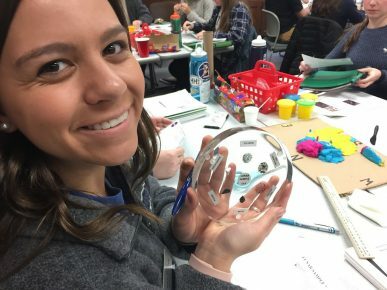 They were brought to the class by NASA Education Specialist Susan Kohler, along with a message to the 26 future K-6 science and social studies teachers in the room: You too can borrow moon rocks to show to your students. NASA actually has been lending moon rocks for decades. Pangan said in the 1980s, her mom—a seventh-grade science teacher—borrowed some for her class. Last year, when The Children’s Museum of Indianapolis opened an exhibit related to the International Space Station, Pangan recalled her experience and contacted NASA. (In a class two years ago, her students had the opportunity to speak with astronauts in real time who were in space aboard the International Space Station.) Her students will be working with the museum later this semester to provide some Space Station-related activities for school groups. 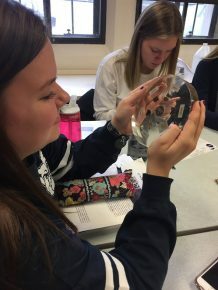 In Tuesday’s class, Kohler spent several hours presenting space-related lessons the students can replicate in their classrooms as well as training them in how to request to borrow sample disks containing moon rocks. As Pangan’s class discovered, teachers go through a multi-step process to obtain what’s known as “Lunar Handling Certification—forms to fill out, security precautions that must be taken, and more. As Kohler reminded the Butler students repeatedly: These rocks are irreplaceable. But getting the rocks into classrooms is well worth the effort, said Matt Mackowiak, a senior from South Bend, Indiana. He was excited to see the rocks for himself—“Oh, my gosh, yes. You have no idea”—and to get them for the students at the Butler Lab School, where he student-teaches fifth and sixth grade. Pangan said this is the first time she’s done anything like this with her students in this class. It will happen again. "We had a security guard outside our house, my mom had to put the lunar samples in a safe at the bank, and she had a band on her arm that was hooked to the briefcase that held the rocks."